The weather had begun to cool, but the chill in the air did not stop Urban Initiatives’ Work to Play students and a group of volunteers from PwC from traveling to Chicago Indoor Sports on October 21 for a Friday afternoon Game Day. Participants from Claremont, Davis, Greene, and Morrill played in three rotations of small, 7v7 scrimmages. They put their soccer skills to the test, showcasing the hard work they had put in during practice earlier in the week, and they exhibited the qualities of teamwork and sportsmanship, with the help of their assistant coaches for the day, the PwC volunteers. 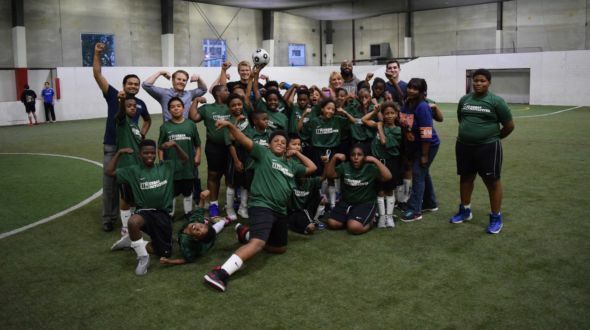 The students had been so excited for the opportunity to meet kids from other schools and neighborhoods all week, and that excitement was manifest in the positive energy the children brought onto the indoor turf. Some of the students’ parents and families came to Game Day, too, to cheer their loved ones on from the sidelines. The volunteers offered words of encouragement as they played, and, at the end of the session, they even played the Numbers Game with the students from Claremont! The adults won, but only just. The afternoon ended with a discussion around the theme of the week in the Work to Play curriculum: commitment. Thank you so much to the volunteers from PwC for taking the time out of their afternoons to experience some soccer, fun, and friendship with our students!